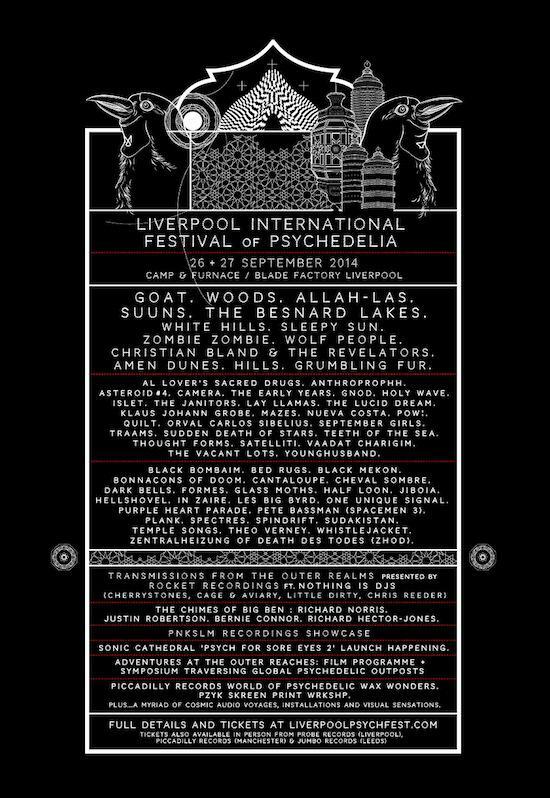 New additions to the Liverpool International Festival of Psychedelia! First up is Grumbling Fur, who will have released their third album, Preternaturals, via the Quietus' own tQ Phonographic Corporation label, by the time the festival takes place, from September 26-27 at Camp & Furnace. They join the line-up alongside the mighty Besnard Lakes, Allah-Las, Christian Bland & The Revelators, The Vacant Lots (watch the site for further coverage of them today), Traams, Quilt, Asteroid #4, Nueva Costa, September Girls, Spectres and Spindrift. All of the above are added to a bill that already includes Goat, Woods and Suuns - head to the Psych Fest's website for the full rundown. Not only that, but the two-dayer has yet more additions, in the form of ace label Sonic Cathedral joining forces with equally ace poster makers Heretic to launch their new compilation, Psych For Sore Eyes 2. Continuing the screen printing theme, there'll also be a workshop giving you the chance to have a crack at it yourself, alongside Adventures At The Outer Reaches, a psych symposia and cinema programme, and Piccadilly Records' World Of Psychedelic Wax Wonders, a pop-up shop from the top Manchester record store. For those of you wanting to max out on the psychedelia, the festival is also offering 'Psych Dorms' at the city's Hatters hostel, which you can get in a package alongside a two-day pass; head here for further details. Take a look at a new trailer video below.